Four minutes before the hour - Lugubrious, sardonic thought: "What's the difference between Japan's dovish Minister of Law and its hawkish Minister of Defense? The dovish minister gives out orders to kill people and they get carried out." 15:00 Tanigaki comes in, bowing and smiling, not wearing his trademark glasses, without tie. 15:05 He wants to talk about immigration regulations, reform in corporate law and what the Law Ministry is doing to facilitate the recovery of the tsunami, earthquake and nuclear meltdown affected areas of Northeast Japan. Aside from substantial changes to immigration procedures, if he ends up talking about such, not much in Tanigaki's opening remarks for non-Japanese journalists to chew on. 15:15 Still talking about immigration procedure reform. Leaves me wondering whether the first, annoyed questioner will ask about Japan's death penalty or the arrest of women who distributed data allowing a a 3-D printer to reproduced with a 3-D printer a perfect 3-D copy of her genitalia (Link). Am rooting for the genitalia option. 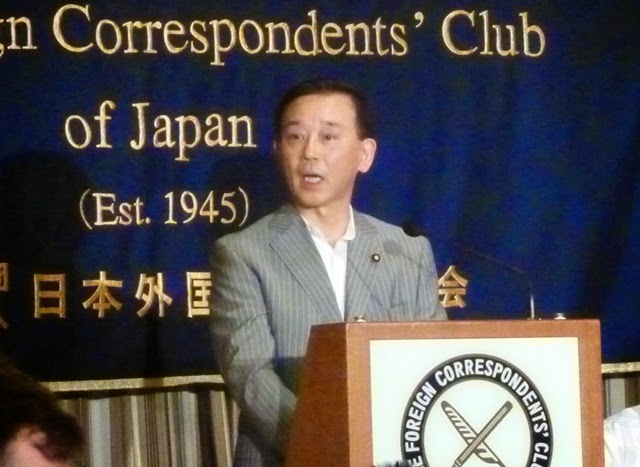 15:20 Substance makes a sudden appearance: Tanigaki condemns the abusive employters of foreign technical training visa holders - a system that has been compared to bonded labor. 15:25 Why is a Law Minister talking about corporate governance? Is this not a mission for the Minister of Economy, Trade and Industry? 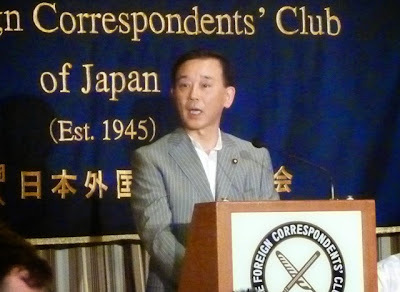 15:33 It is official; Minister Tanigaki is just burying foreign journalists under unprintable dreck. I am not sure he knows why he is here, unless it is to whip the attendees into a vengeful anger. 15:45 First question is on...Abenomics. Uh, Tanigaki was Finance Minister in the...Koizumi Cabinet. 15:48 Second question is on legislation against hate speech, from a Singapore journalist. Is she asking about insults to the Lee Family? They seem to handle such speech in a most...liberal-minded way. 15:50 Four minute answer -- someone send a bouquet to the poor translator. 15:55 Thank you Richard! "What do you feel when you sign the death warrants...?" 16:07 The conference is winding up. Tanigaki is still talking but folks are heading out. The big takeaway - the Minister of Law wants greater protection for the low-paid workers brought in through the technical training visa program. He admits these visa holders have been abused by unscrupulous employers.